Controlling spotted drosophila (SWD) is difficult due to its short generation time, wide host range, lack of natural predators, and even its hearty immune system. Organic growers face an especially hard task, being constrained by control practices that are organically approved. We take a look at current research and best practices for monitoring and controlling SWD in organic systems. The most common method for detecting SWD presence is trapping. SWD traps are commercially available but can also be made by hand. Many commercial lures are organically approved and hang above the liquid inside the container, but homemade lures are also commonly made. Lure recipes involving yeast, apple cider vinegar, and sugar dissolved in the trap water are available online. SWD traps are important because they indicate when the pest is first present on the farm. However, once SWD presence has been determined, the usefulness of traps likely diminishes. There is little to no current data consistently linking SWD trap numbers to total presence in the field or fruit infestation levels. This is confounded by the variable effectiveness of trap types and environments, making it difficult to establish trap threshold standards. Additionally, there is no evidence that SWD traps are an effective method for reducing overall SWD populations in the field. Thus, the labor and economic costs of maintaining SWD traps after their presence is first determined may be more than the potential benefit of leaving them for the extent of the season. Phenology management, or avoidance through early management, requires knowing when SWD first arrives in an area, and is thus informed by trapping. Essentially, this technique embraces the philosophy of “if you can’t beat them, avoid them.” If a grower lives in an area where SWD is not present year-round, they may have the opportunity to grow crops with a fruiting window that does not correspond with peak SWD season. For example, a grower in southern Minnesota can plant early-season blueberries that mature in early July. Even though this fruit is susceptible to SWD infestation, they can harvest relatively risk-free because SWD doesn’t appear in high numbers in this environment until harvest is ending. Phenology management will be more effective in areas where SWD populations vary over the year. Regions where SWD is present year-round will likely not benefit from this practice. Only organically approved insecticides can be used for SWD control on organic land. Any product listed by the Organic Materials Review Institute (OMRI) can be used on organic land, as long as application guidelines are followed. Organically approved spray options for SWD control are limited, both in availability and effectiveness. A two-year, multi-university study funded by USDA’s National Institute of Food and Agriculture Organic Research and Extension Initiative (OREI) observed Entrust SC (Corteva Agriscience) as the most effective spray for SWD control, with Grandevo (Marrone) also showing effectiveness controlling third instar larvae within infested fruit. Adjuvants can be mixed with insecticides to increase their efficacy. Attract-and-kill pest management tactics utilize attractants to bring a target pest into contact with a killing device, including traps. While SWD traps are useful for detecting initial SWD presence in the field, using them for management is difficult, as multiple hundred traps per acre may be required. 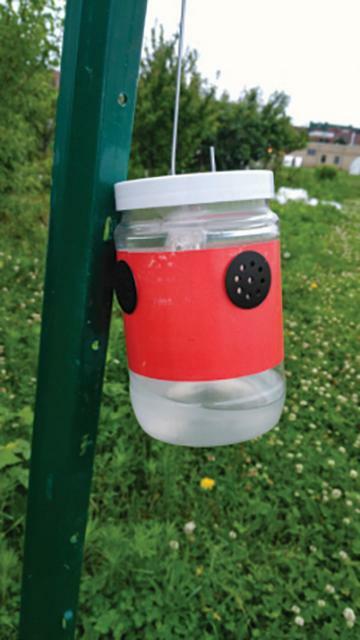 Attract-and-kill (AK) devices that work by luring SWD to an insecticide or other killing method may provide a lower maintenance approach for reducing SWD populations and thus infestation. They offer advantages over traditional spraying that include: less pesticide use, pesticides being concentrated on the device instead of plant material or fruit, and combining the insecticide with attractants to promote oral intake. While potentially useful, AK devices are still not thoroughly researched or commercially available. Environmental research has observed that SWD are most active at dawn and dusk, preferring to stay in cool, moist, and shady areas during the day. The interior plant canopy of most fruit crops can provide this environment, possibly making it easier for SWD by hiding within the very plants they infest. Research is underway to determine if intensive pruning techniques can alter the microenvironment to be less beneficial for SWD, thus reducing infestation. Research is being conducted in multiple states on blueberries, blackberries, and raspberries with three major pruning treatments: a grower standard prune, a light prune with approximately 25% more canopy coverage, and a heavy prune with approximately 25% less canopy coverage. In 2016, data indicated that while heavy pruning often results in reduced total yields, pruning treatments have little effect on cumulative SWD infestation. However, preliminary 2017 data on Minnesota blueberries suggest that a heavier prune can result in a higher proportion of fruit available at the beginning of harvest. This may have phenological effects, loading a higher proportion of fruit into a window when SWD is not present in the environment. Another possible advantage of pruning is the effect it may have on other control methods, such as spraying. By reducing the total canopy area, heavier pruning could allow sprays to penetrate farther into the interior of the plant, where SWD are known to typically gather during the heat of summer days. Fruit infested with SWD often fall to the ground before adult emergence. In 2016, the OREI SWD project researched the effects of different mulch types on within-fruit SWD development. Berries infested with SWD were placed both on top and underneath the surface of several mulch types. It was observed that temperature conditions underneath the surface of mulch were much less than the maximum temperatures observed on top. Correspondingly, these under-the-mulch treatments also had higher levels of SWD emergence from fruit. These findings can help growers make more informed cultural practice decisions for SWD management. A 2016 survey revealed that growers sometimes bury fallen fruit as a sanitation practice. However, these results imply that such a practice provides infested fruit with more ideal developmental conditions and may actually increase SWD emergence and presence on the farm. Exclusion management is the practice of creating a complete physical barrier around a crop. The barrier should restrict outside pests and pathogens from coming into direct contact with plant tissue, but also may alter environmental conditions around the crop. Growers may be hesitant to employ exclusion practices due to initial infrastructure costs and/or the notion of trapping pests within the barrier if they manage to migrate inside. However, OREI research has observed that this organic practice can be consistently effective at reducing SWD infestation in small fruits. SWD exclusion can mean completely enclosing a crop in plastic or a fine mesh insect netting, but often involves both — constructing a plastic-covered high tunnel around a crop, and covering any entrances, exits and ventilation holes with insect netting that SWD cannot pass through. This mesh can be found through several commercial sources. Nets with tighter weaves are often heavier and exclude more insects; 80-gram insect netting is recommended for excluding SWD. 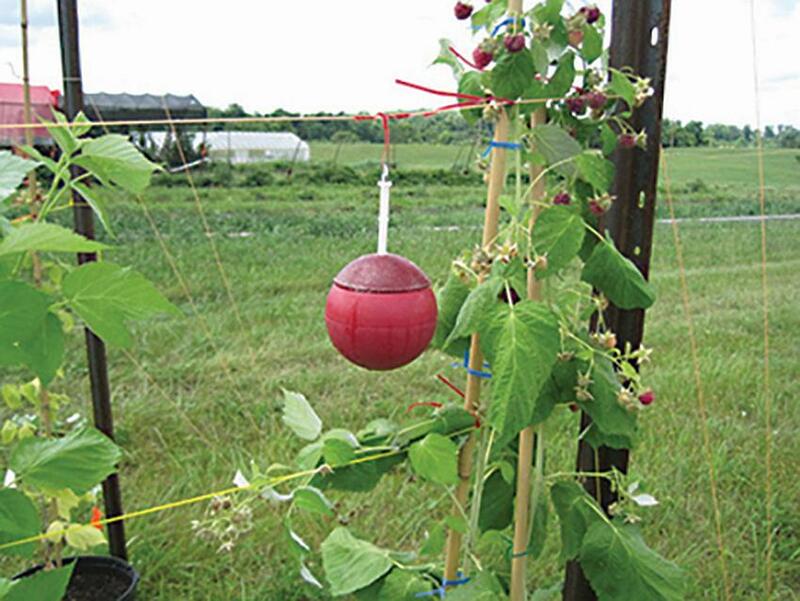 In 2015, exclusion practices in Minnesota reduced SWD infestation of fall-bearing raspberries to approximately 2%, compared to 80% infestation in uncovered plots, and 61% infestation in uncovered plots treated with conventional insecticides. Netting has shown similar effectiveness in reducing SWD in blueberry. 2016 OREI exclusion research conducted on raspberries, blueberries, and blackberries in Michigan, Arkansas, and Minnesota all observed higher temperatures and lower humidity inside exclusion tunnels. These tunnels also had significantly lower SWD infestation and higher marketable yields compared to uncovered controls. SWD’s broad host range and lack of native predators make it a threat to fruit growers throughout the country. Organic control options are limited, but there are research efforts and various ways that growers can limit SWD presence and infestation on their land. Even more innovative research is being conducted on organic SWD control, so check publications from Extension agencies near you. 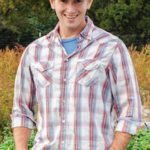 Petran is a former postdoctoral associate with the University of Minnesota and is currently an organic strawberry grower. See all author stories here.